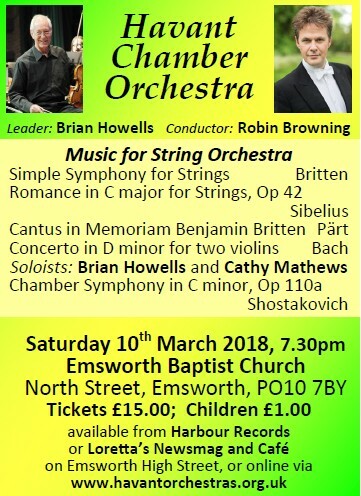 If you see this Newsletter in time, don’t miss our HCO Strings concert in Emsworth Baptist Church on Saturday 10th March (details below)! 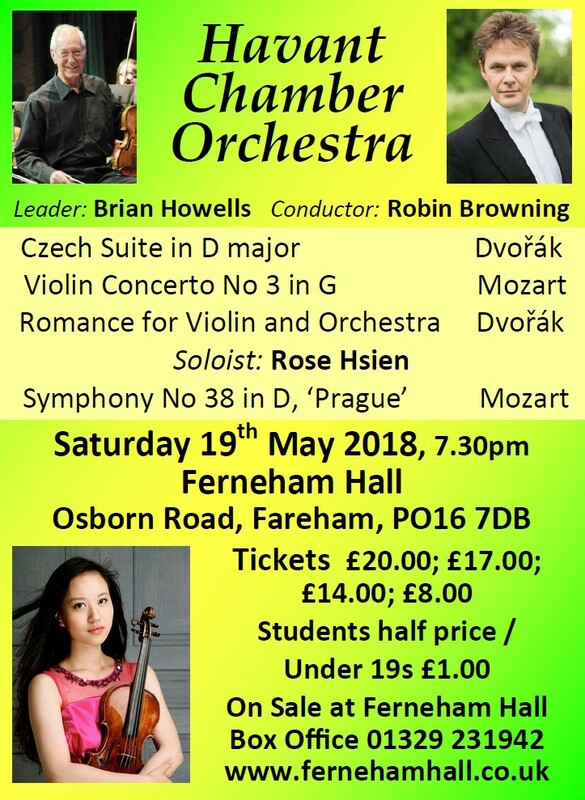 After our first HCO strings concert there a year ago, the feedback from audience and players was that they had all enjoyed the concert immensely and would like another one next year. We have therefore returned for a second concert, again as a development activity subsidised by the recent very generous legacy from Margaret (and Tony) Packe, who lived in Emsworth. Some HCO string players will also be back in Emsworth in two weeks time. Havant Baroque, an ensemble which includes several players from HCO and is led by Cathy Mathews, has been invited by the Mayor of Havant to perform at St James’s Church at 3pm on Sunday March 25th as the final concert of the second Havant Music Festival. We hope to see you there! Havant Symphony Orchestra’s concert on Saturday 17th March has been included in the Havant Music Festival schedule as well. The Mayor of Havant will be in attendance and in support of the festival there will be a collection for the Mayor’s charities. Three of the four works in this concert (the Liszt, Dvořák and Mussorgsky) have never been performed before by HSO in its 55-year history, even though they are all famous and fascinating works, and we are very happy to be able to rectify that omission now. The Liszt will be familiar to fans of Tom and Jerry, Bugs Bunny or Daffy Duck! 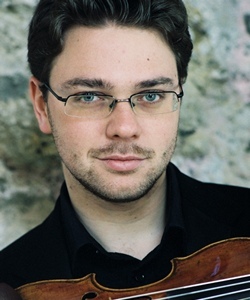 We are especially pleased to welcome Alexander Sitkovetsky to perform the Dvořák violin concerto, returning for his fourth appearance with the Havant Orchestras. 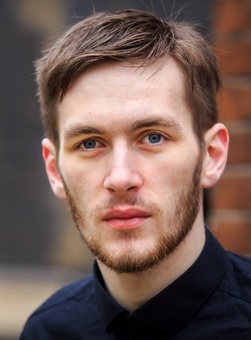 Our bursary student Richard Miller will be conducting Delius’s stirring interlude. The Mussorgsky concludes the concert, ending in grand style with the Great Gate. 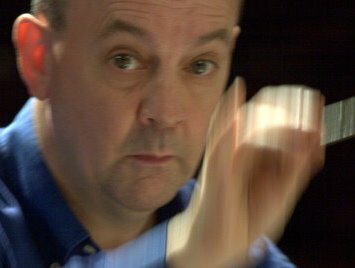 The pre-concert talk about the works in our concert will be given by our bursary conductor Richard Miller. Musicians tend to collect music or, perhaps, hoard might be a better word – I think conductors are probably the worst!! The problem arises when folk tell you that they have a relative, who is having a clear-out and wonders if you would might like any of his or her music? You try to resist but then they mention that their uncle, shall we say, used to conduct a local orchestra in Chester or wherever and he is getting rid of a large section of orchestral material that he has acquired over the years! Well that’s it - and one simply can’t refuse, particularly when you are told that he is likely to put a match to the lot, if no one wants it. Help! Now, burning music, of any kind, is practically a mortal sin and the thought of all those ‘dots’ going up in smoke makes you positively shake, so you instantly say ‘YES – I’ll have the lot!’ Of course, you have no idea what said uncle might have purchased but, who knows – there might be a hidden gem or even some long-lost work by Butterworth or similar? Unlikely, but one never knows? Why is he rambling on, I hear you say – well it’s because this is just how I came upon the orchestral arrangement of the Liszt Hungarian Rhapsody which we are going to play. Sometimes the ‘library’ of music you have acquired sits sadly in a pile in a back bedroom, gathering dust, until you find time to look through it. For me it’s usually when I need to choose the repetoire for a Summer course I conduct on every year near Deal in Kent. I dug out the Liszt, not knowing what the arrangement would sound like, and loaded it into the back of my car, along with masses of other orchestral sets – familiar and not so familiar! On arrival at the the course, and our first rehearsal, the dust was blown off the Liszt and we sight-read it through and, ’though it wasn’t a perfect reading by any means, it was clear that the arrangement worked and that it would be very suitable for inclusion in the final concert a week later. So, there you have it! I am sure you will enjoy it. Now, I have almost used up my allotted number of words for this Newsletter and you really don’t need me to say anything about Mussorgsky’s wonderful Pictures at an Exhibition - surely? I have conducted it any number of times, in varying and unusual venues, but I think it will work extremely well in the lovely hall in Waterlooville. On the subject of arrangements - Ravel’s one of Pictures is undoubtedly the best, so that’s what we will give you. It’s been arranged for everything - from brass ensembles to piano duets, ’though I don’t know if it has been arranged for a recorder ensemble? I must do some Googling! Delius’ music is almost like an English impressionism. The term impressionist, so far as music is concerned, usually refers to music by the French composers Debussy and Ravel – indeed, Delius was a great admirer of Debussy. Delius’ beautiful, languid melodies are accompanied by his unique, ‘bluesy’ harmonies; this bluesy-ness came as a result of his brief period in Florida managing an orange plantation. I usually take issue with Delius’ form, but this piece, for me, is perfectly timed – not too long, not too short; none of the musical material outstays its welcome. Listen out for the interval of a minor 3rd in his melodies (that which a cuckoo makes) – it wouldn’t be Delius without it! So far, every run-through in rehearsal has had something slightly different about it in terms of tempo (speed) and balance (lines drawn out) – the mark of a decent rhapsodic piece, I think! I hope I will settle by the time of the concert… that said, it’s nice to have room for some improvisation. If you’re coming to Delius for the first time this evening, I’d recommend as further listening his On Hearing the First Cuckoo in Spring, another orchestral miniature. I’d also recommend his choral piece A Song of the High Hills – his choral music, though beautiful, is often incredibly difficult to perform, and so isn’t often done. Sony Classical Masters 8869 7939842 £5.75. See the Events page on our website www.havantorchestras.org.uk for more information about these orchestral concerts and musical events in the area, and visit musicinportsmouth.co.uk for even more musical events including choral music as well as instrumental.